Most of the new homes in our region are built with either a cement fiber-board such as Hardie Plank or a wood-resin composite such as LP’s SmartSide materials. Just to be clear from the top, these are both quality products and nothing I have to say that follows is a slam against them. No, my complaint is that these sidings are all to often compromised during the installation process. This won’t be readily apparent for a decade or two, but I do expect that we’ll see a wave a failures. Complaints to the companies are going to leave a lot of consumers unhappy because the consensus opinion will be that the warranty was voided at the time of installation. Why is My Warranty Voided? Speaking bluntly, your warranty for the siding is likely voided because the contractor couldn’t be bothered to read the installation instructions provided by the manufacturers. It’s not as though the specifications are unduly complicated or long. The James Hardie instructions run four pages. The LP SmartSide runs five. Both have plenty of pictures for the literacy-challenged. There should be a piece of metal flashing installed in these locations. This flashing is commonly called head flashing or Z-flashing. It is installed under the top piece of siding, extends over the vulnerable horizontal surface, and finishes with a downward leg to clear the water from the trim. In the first picture, if you look closely you can see the flashing (it is painted the same color as the siding) over the horizontal trim at the front porch. In the second, the flashing is plainly missing. Not only is this flashing required by most, if not all, manufacturers, there is even a code reference. This flashing has been in the International Residential Code since 2009 (R703.8 Flashing). There are a variety of clearances to consider when installing siding. Clearance refers to the gap we leave from the siding to another material. For example, by code we leave six inches between the bottom-most edge of the siding and soil. By specification, we are supposed to leave two inches between Hardie Plank and the roof deck. SmartSide only requires one inch in this location. This is a consistent difference between the two materials. Your inspector should be able to recognize the difference between them and apply the correct specification. That said, good luck in getting most contractors to actually follow the guidelines. Damage evident at the base of the wall due to water contact. Brand new and prepped for failure. Poor clearance to the deck and soil. “ . . . felt or other approved water-resistive barrier shall be applied over studs or sheathing of all exterior walls.” That is a direct quote from the IRC. It does not differentiate between the top of walls on gable ends or the garage against those at living spaces. So why do I see this on local job sites? Seen recently on a job site nearby. 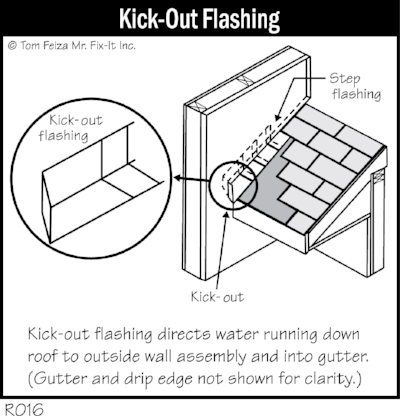 Kick-out flashing is supposed to be installed at the intersection of a roof and a vertical wall. This piece of flashing is angled so that water running down the roof deck is directed away from the wall and into a gutter. If the water is allowed to flow unimpeded against the siding, there will be damage. The only question will be one of degree. So there we go. Four reasons to keep a sharp eye on your siding contractor. Just an FYI, this doesn't just apply to new homes. I've seen the same types of failures on older homes that were re-sided.